It's a crossbow head designed and tested at speeds over 400 FPS! Each blade has a strategic 3-blade design with devastating 1 3/8" cutting diameter for max effectiveness. 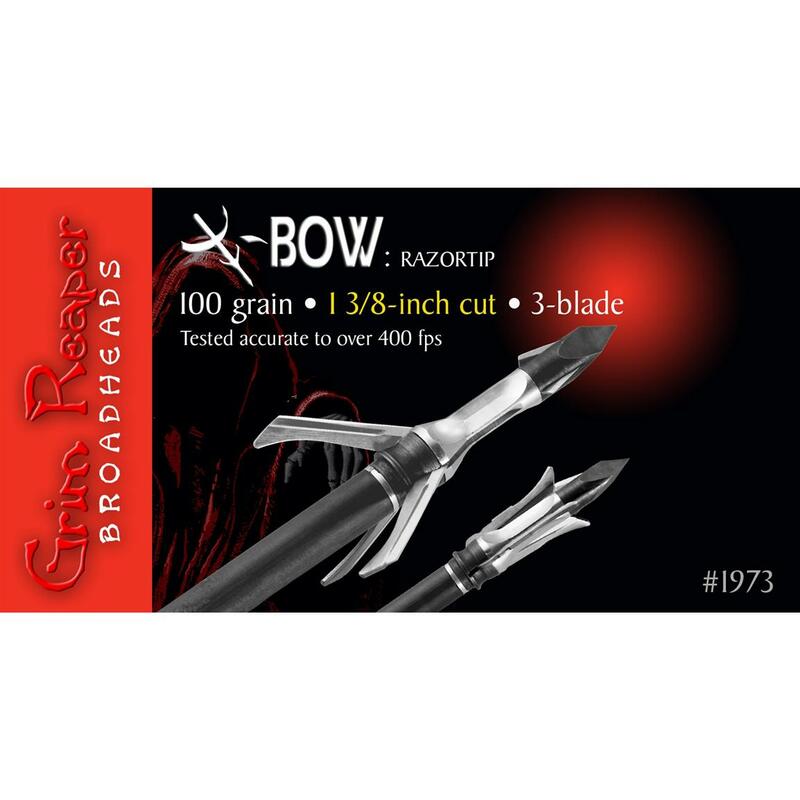 Grim Reaper Crossbow Broadhead RazorTip 1-3/8 125 Grain, 3 Pack is rated 5.0 out of 5 by 11. Rated 5 out of 5 by Lenny from Great accuracy I bought my original 3, shot one, killed one hog, was impressed with the devistation and how the arrow survived the ordeal. I order these for back up. Rated 5 out of 5 by Tom 805 from Dead deer After a year of reading reviews I picked this year to be the one that I tried Grim Reaper, mostly because of the reviews on reliability. I'm shooting a Mission MBX 400 (crossbow), so I needed a broad head that wouldn't open in flight, the biggest choice was to stick with 100 grain or step it up to 125 grain, because I was looking for the best down range energy with the least drop at yardage, I went with the 125 grain and I'm so happy with the choices I made. On my first day in the woods this year at about 20 minutes before dark within 40 yard I dropped my first buck of the year with a clean through and through shot. If you are looking for a rock solid broad head for a cross bow (or vertical) that fliers like a field tip, opens on impact and leaves a massive exit hole, this is the one you should consider. Rated 5 out of 5 by DOROTHY / NORMAN from Nice Broadheads, I use them every year. Rated 5 out of 5 by TERRY from My son took a buck and bear this past season with these. Neither animal went 20 yards, it's hard to not be impressed with these. Great product. Rated 5 out of 5 by KENNETH C from Product looks like it will do the job. Can't wait to try them out. Rated 5 out of 5 by TERRY from I'll be interested to see if they solve my son's problem with expandable broadheads opening early from his crossbow.